UMP | University of Minnesota Press Blog: On healing, settler colonialism, and Hawaiʻi: How can we use Idle No More's momentum to push for changes in education? On healing, settler colonialism, and Hawaiʻi: How can we use Idle No More's momentum to push for changes in education? In The Seeds We Planted: Portraits of a Native Hawaiian Charter School, Noelani Goodyear-Kaʻōpua explores the paradoxes of reasserting Indigenous knowledge within a school system that has historically underwritten settler colonialism. She also asks how Indigenous and settler peoples can work together to unmake settler-colonial logics of elimination and containment. Here, Goodyear-Kaʻōpua comments on ways Indigenous movements such as Idle No More, an ongoing protest movement originating among Aboriginal peoples in Canada and formed in 2012, can move to the next level of resurgence and transformation. Students of the Native Hawaiian Charter School Halau Ku Mana sail in Kanehunamoku's home waters of Kane'ohe Bay off of Honolulu. In her book, Noelani Goodyear-Ka'opua reveals a critical tension: the successes of a school celebrating indigenous culture are measured by the standards of settler colonialism. We need to go beyond demonstrations and rallies in malls and legislatures and on public streets and start to reoccupy Indigenous sacred, ceremonial and cultural use sites to re-establish our presence on our land and in doing so to educate Canadians about our continuing connections to those places and how important they are to our continuing existence as Indigenous peoples. The work of regenerating Indigenous communities’ land-based relationships requires that those who have been galvanized by particular environmental concerns demonstrate lasting support for Indigenous nationhood and sovereignty. Healing is often a long and slow process. In Hawaiʻi, five days after (yet in solidarity with) INM’s “#J11 global day of action,” hundreds of people marched on the State Capitol in Honolulu. January 16, 2013, was significant here in the islands not only because it was opening day of the state legislature, but it also marked the eve of the 120 years since the US began its prolonged occupation of the Hawaiian Islands, denying Hawaiians sovereignty. Like INM, what brought Native Hawaiians and settlers to the streets that day was a shared concern for the poisoning of lands, waters, and bodies by multinational corporations. The event was the most recent in a long battle against the rampant growth of corporate agribusiness use of lands in Hawai‘i for cultivating genetically modified seed crops. “No GMOs” has become the shorthand for opposition to a range of practices, from the patenting of Native food plants to the open field-testing of experimental GM crops. In The Seeds We Planted, I write about how students who became to be involved in early efforts to protect against the genetic modification and patenting of taro—ancestor and staple food of Kanaka Maoli (Native Hawaiians)—learned valuable lessons about institutional power, legislative process and the strength of their own voices. On one hand, the rally was—like INM—an invigorating demonstration of coalitional activism around protecting the earth. On the other hand, the fissures and need for dialogue between the various constituent groups was plainly apparent. As I stood in the crowd, some settlers who had come to support a GMO-labeling bill and to see world-renowned author-activist Vandana Shiva speak looked genuinely puzzled when Kānaka Maoli took up the mic to talk about the protection of Hawaiian burial sites or resisting the gathering of names for a state-sponsored Native Hawaiian roll. One man complained on the sidelines that the event was “hijacked” as a rally for Hawaiian sovereignty. I left feeling like the event opened the space for much needed further dialogue and education, but these were the kinds of conversations that would take more time and a slower pace than the rush of an action at the state legislature. No GMO March & Rally at Hawaii State Capitol from A New Awareness Media on Vimeo. Remedying the ongoing violences of settler colonialism and healing the land and our relationships with one another requires more protracted pedagogical work than can be accomplished in a series of rallies. One way that we can use the momentum created by Idle No More is to push for systemic change in our educational systems. In settler colonial contexts such as Canada, the U.S. or Hawai‘i, we need long-lasting, publicly-funded educational opportunities that engage Indigenous and settler participants in different ways of relating to the land and in dialogue with one another about how to place the health of our natural environments at the center, while attending to our different genealogical relationships to lands. 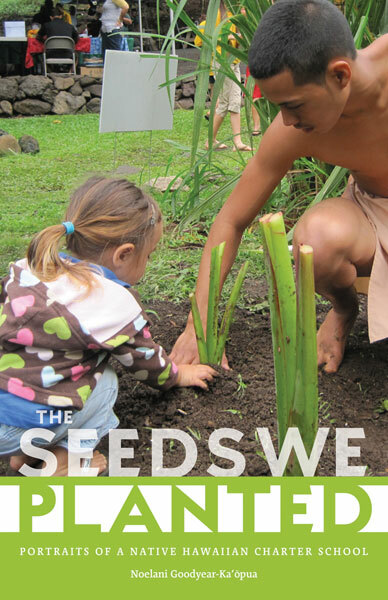 In The Seeds We Planted, I describe the ways Kanaka Maoli educators seized upon the opening created by the crashing of two distinct waves—late twentieth-century Hawaiian nationalist movements and U.S. educational reform movements based on school choice—into one another. The convergence of these movements produced a moment of possibility, as Kanaka Maoli communities could, for the first time in over a century, take direct control over our educational destinies by starting our own charter schools. Predominantly Native communities, which were explicitly asserting Indigenous rights to educational self-determination, accounted for more than half of those groups who initiated public charter schools in Hawaiʻi. As some leaders of the Hawaiian charter school movement put it, these new schools provided spaces of liberation from the failures of assimilatory schooling, as well as the inadequacies of earlier models of Hawaiian studies education that included representations of Kanaka Maoli without disrupting dominant epistemologies and relations of power. Students at Halau Ku Mana observe and fortify the pu'epu'e (mounds) in which the taro plant grows. This type of interaction allows students to interact with their plants without damaging the root systems. These sorts of realizations and reconnections take time, more time than the few months in which Idle No More grew into an internationally recognized force. However, the momentum and visibility generated by INM can be leveraged to fight for the kinds of infrastructure, resources and autonomy that are necessary to create and sustain the long-term strategies that will bring healing to our societies and environments. We can direct some of the energy from this moment in history to carve out more educational pathways that will allow young people to learn how to rebuild structures that nurture the resiliency of their lands and social networks. Noelani Goodyear-Ka‘ōpua is author of The Seeds We Planted: Portraits of a Native Hawaiian Charter School. She is associate professor of political science at the University of Hawai’i at Mānoa. She was a cofounder of the Hālau Kū Māna public charter school and served as a teacher, administrator, and board member at various times during the school's first decade. "Like the stone walls of the ancient irrigation ditches rebuilt by the Hālau Kū Māna Native Hawaiian Charter School that Noelani Goodyear-Ka‘ōpua writes of, this book channels the pain, struggle, hope, and mana (power and authority) of the Hawaiian people into a place of life and growth. Drawing deftly upon Native studies, history, anthropology, gender studies, cultural studies, and education, The Seeds We Planted redefines the meaning and purpose of ethnography." "In this powerfully told story of Indigenous language, education, and cultural reclamation, Goodyear-Ka‘ōpua documents how the seeds of resistance to colonial schooling have brought forth a remarkable educational enterprise, the Hālau Kū Māna public charter school. The school exemplifies a strengths-based, Indigenous self-determined pedagogy. This beautifully written book is one that all those concerned with education for a critical, sustainable, pluricultural democracy will want to read, use, and share widely."